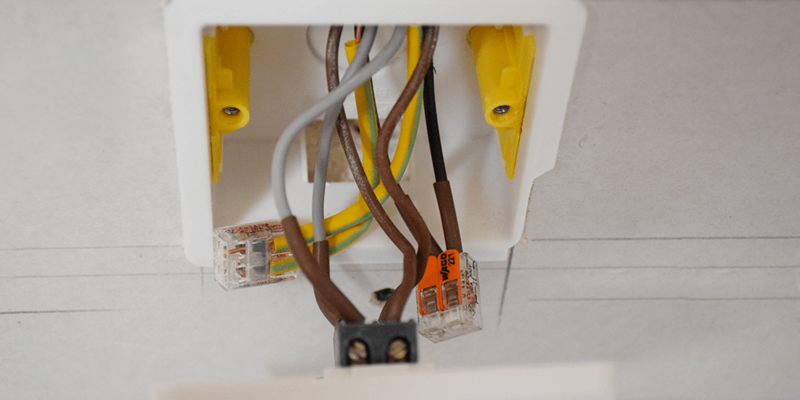 In our new series, we are looking inside the circuit to find out what components make up a pendant lighting circuit, dangers to look out for and also answer common questions asked by homeowners and electricians. This resource focuses on common light fixtures and lighting switches found in the home. 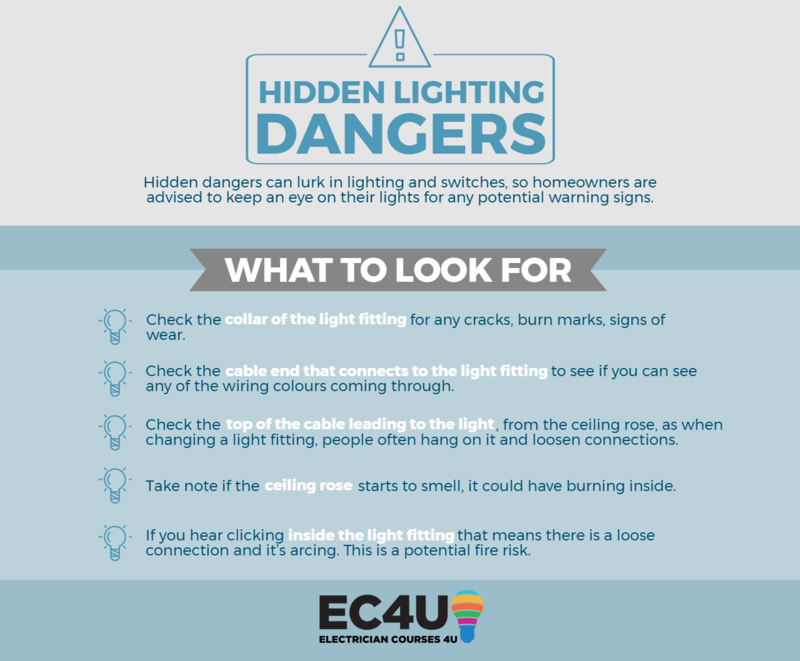 Please remember if you are unsure of any lighting problems you may have, it is important to seek advice from a registered electrician. The most common light in homes is a pendant, from which you can hang a variety of lamp shades, fixtures and chandeliers. 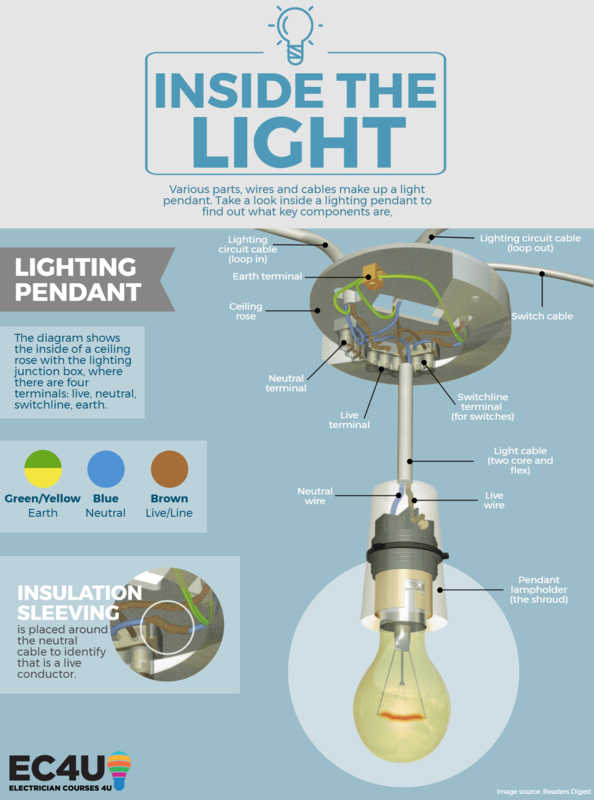 Important parts of the pendant light are the ceiling rose, the cables that connect within the ceiling rose, the shroud that protects you and the light bulb fitting. Cabling used for lighting circuits is twor core and earth, which include a live, neutral and an earth core. Earth is identified by green and yellow sheathing, neutral is blue and live is brown. Live is also known as switchline, line and loop-in. Loop in allows you to carry electricity from one lamp to another lamp. 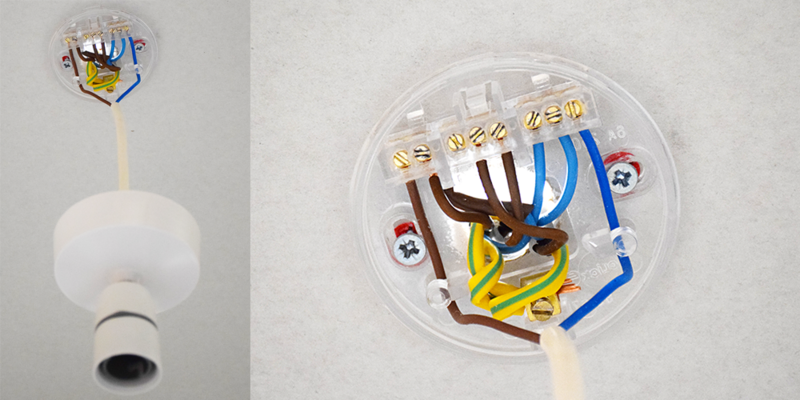 Inside the ceiling rose of a pendant light there are four terminals: live, neutral, switchline, earth. Power comes into the light via a cable from the consumer unit, containing live, neutral and earth wires. The light cable is connected to the switch line and neutral wires, which gives the power to make the light work. 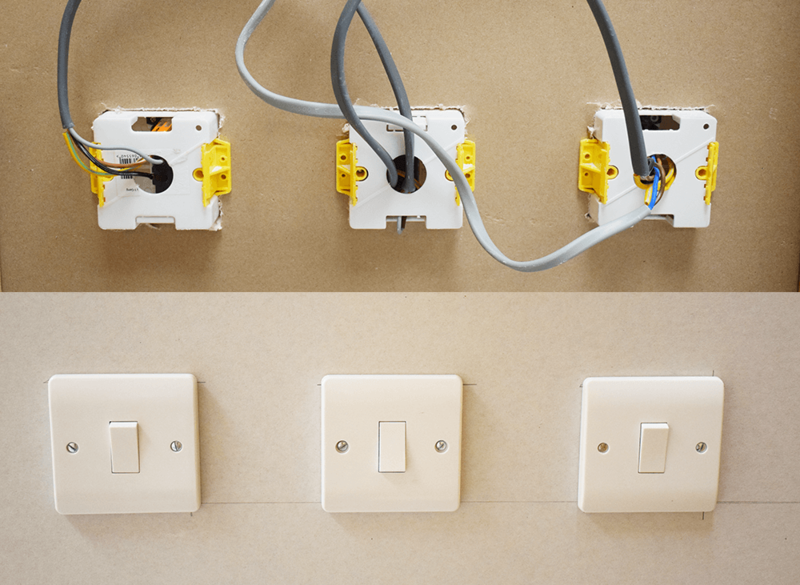 There are three main types of switches: a single that has one switch and goes on and off, a two way switch is one or more lights from two positions (top and bottom stairs), and an intermediate switching switches 1 or more lights on from 3 or more positions (open plan room with 3 or more entrances). As seen in the diagram above, the cable that controls the switch contains the switchline, live and earth wires. Hidden dangers can lurk in lighting and switches, so homeowners are advised to keep an eye on their lights for any potential warning signs. One of the biggest things that can go wrong with ceiling lights is with people confusing the wires when they open them up to change as a light fitting. DIY electrics can be the biggest fire risk in your home and you should always seek advice from a registered electrician to be safe. Check the collar of the bayonet for any signs of damage, e.g. visible cracks, burn marks, signs of wear. Check the cable end that connects to the light fitting to see if any of the wire colours are showing. Check the top of the cable leading to the light, from the ceiling rose, as when changing a light fitting, people often hang on it. This loosens the cable and leads to wire colours showing through and connections loosening inside. If the ceiling rose starts to smell, it could have burning inside. If you hear clicking that means there is a loose connection and it’s arcing. Electricity is like a balloon and it expands and collapses in a cycle of 50 times a second, which means it’s slowly undoing the small screw terminals because they get hot, cold, hot, cold, and expand and contract each time. As soon as they undo a certain amount, the cable inside the screw terminal wobbles and you get a clicking sound, as it is jumping with the electricity. As soon as you start to hear a click sound, call an electrician. My lighting pendant case is damaged? What should I do? It will need replacing, as the light bulb cover (the shroud) is there to protect you from touching any live parts. The cable from my ceiling rose is coming loose and I can see cable, what should I do? Due to cable being fiddly to replace, an electrician will need to come in and replace your whole lighting fixture to ensure it is safe for you to use. I’m decorating my home, can I remove the switch covers? If you are simply unscrewing the switch cover, pulling the cover away from the wall, and not removing the conductors, then it is important you first safely isolate that circuit. To do this simply turn of the circuit breaker for that circuit. Now it is safe to unscrew the covers and pull them slightly away from the wall. Make sure the covers are back on securely before turning the lighting circuit back on. If you want to completely remove the switch covers from the wall to decorate behind, you must also safely isolate that light circuit first and also note where the conductors go. If you’ve got an intermediate light in the room and you do this, because of the amount of cables, it can be quite confusing. If you really need to remove the covers, it is best to get an electrician in afterwards to check and test the circuits to ensure they are okay. If you find your screw terminals are loose, don’t be tempted to just tighten the screws with a standard screwdriver. Standard screwdrivers are not enough to protect you! VDE screwdrivers are required for safe tightening of screw terminals. VDE screwdrivers protect you with up to 1,000V and with 230-240V there that can potentially harm you, it’s important that the right tools are used. I want to change my pendant light to something else, what can I do? When changing any lighting fitting in your home, it is best procedure to call in an electrician for help. Problems regularly occur when you want to switch to a modern lighting system with 3 connections and a connector block, but when you take down your old lighting pendant down, you find there may be as much as 6 wires. Certain lights need to be fitted in a certain way and homeowners face a tricky and dangerous job by doing it themselves. Just pushing all the wires in, like many have done before, can mean you have a higher risk of fire due to unsafe and incorrect connections. The customer would like dimmers put on a two way light instead of a switch, is this possible? It is not possible to have two dimmers on a two way circuit. But it is possible to have one dimmer switch and a standard switch on a two way lighting circuit. The switch will therefore control when the light is on and off, with the light level set by the dimmer. The lighting circuit I’m working on has two neutral wires – how can I fix this? It was popular in the 1960’s to borrow a neutral for a two way lighting circuit and problems commonly crop up now, when a neutral is borrowed from another circuit to complete a two way lighting circuit. You will notice that you have an additional neutral in the lighting circuit through a visual inspection or when fault finding. How to fix a borrowed neutral is to safely remove the borrowed neutral and make safe, then replace the cable with the right number of cores of the lighting circuits. It was also common in 60s/70s to feed the lighting with 2 core (line and neutral, with CPC either cut out or not used at all). If a bathroom extract fan is then fitted off the existing circuit and the extract fan has an overline facility, then 3 core is required (line, neutral and switchline) but the old fan may have only had 3 cores and then a borrowed neutral from another circuit. Remember, as per 17th Edition all bathrooms must have RCD protection and therefore require 3 core with CPC back to board, as you require an earth path for RCD to work. For any bathroom work, you will also be required to notify Building Control. Stay tuned for our next installment of Inside the Circuit, where next time we look at inside your sockets! In the mean time, get clued up on the old and the new wiring colours!